Embark on this National Park tour and follow in the footsteps of the West’s most intrepid explorers. Begin in Las Vegas, “the meadows,” which because of its plentiful artesian springs, was a welcoming stopover on the pioneer trails west and later a staging point for mines in the surrounding desert. Discover the secrets of the high desert, like the biological soil crust –a dark layer formed from bacteria, lichen, algae and fungi, which protects the soil from erosion, absorbs moisture, and provides important nutrients. Explore Moab, Utah, where Thelma and Louise and Indiana Jones and the Last Crusade were filmed. Visit Arches National Park, where Edward Abbey –an important figure in the conservation movement– worked as a ranger and wrote Desert Solitaire. The schedule below will give you a general idea of the other activities and places you can expect on these tours through parts of Nevada, Utah, Colorado, and Arizona. We plan frequent stops for walking, exploring, and taking photographs. Welcome to Las Vegas, the City of Lights, shows, gambling, world class shopping, and more. Meet at 8 am in the lobby of La Quinta, Paradise Road. Drive to St. George, Utah, for a tour of the LDS temple, a gleaming white edifice, the first temple completed in Utah (New Zion). Enjoy a coffee break at the outlet mall before heading up to Zion National Park’s Kolob Canyons for a scenic drive with spectacular views and a short hike. In the evening arrive on the Colorado Plateau and overnight in comfortable cabins near Bryce Canyon for 2 nights. Explore Bryce Canyon, one of the west’s most beautiful national parks. Stop at the visitor center with interactive displays and a movie. Drive and walk along the rim trails, and– for the more adventurous—hike among the hoodoos through the rugged terrain. Drive on scenic Highway 12, one of the few highways designated All-American. Stop at Kodachrome Basin State Park for photos and a walk. Examine colorful petrified wood at Escalante Petrified Forest State Park. Depending on temperatures, we plan a longer afternoon hike to Lower Calf Creek Falls. Night in Torrey, gateway to Capitol Reef National Park. Explore Capitol Reef with a visit to historic Fruita and, weather permitting, a hike through a hidden canyon. Walk amid the rock formations at Goblin Valley State Park. Stop to view prehistoric Petroglyphs and pictographs at seldom visited Sego Canyon. Then on to Moab, a lively western town, center for slick rock mountain-biking, and gateway to both Arches and Canyonlands National Parks. 2 nights in downtown Moab. Spend the morning in Moab exploring the art galleries, optional whitewater adventures, mineral and rock shops, restaurants, and more. 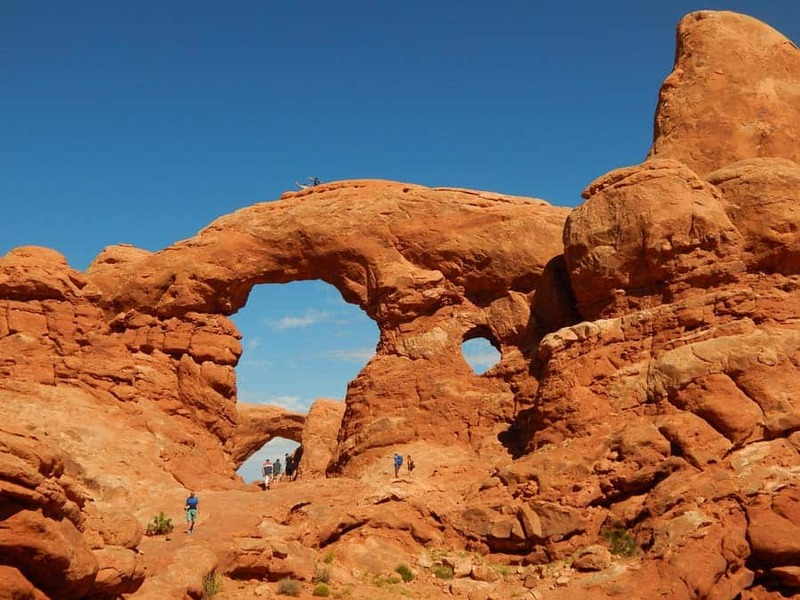 Today’s highlights are walks in Arches National Park, including to Landscape Arch and to the famous Delicate Arch, which graces Utah’s license plates. Stop at the famous viewpoints of Canyonlands National Park, including Mesa Arch. Then visit Dead Horse Point State Park overlooking the Colorado River. On to Ouray, surrounded by the towering peaks of the Rockies. Relax in natural mineral baths. Night in Ouray. Discover the historic towns of Silverton and Durango, connected by the Durango & Silverton Narrow Gauge Railroad, a heritage railway in operation for 128 years, once used to transport silver and gold from the mines of the San Juan Mountains. Night in Mesa Verde National Park, a world heritage park. Visit the ancient pueblos of the Anasazi peoples at Mesa Verde National Park. Then photograph for yourselves the familiar views from Monument Valley Tribal Park, towering sandstone buttes made famous by John Ford’s westerns. On to Page near Lake Powell for the night. Hike to the Horseshoe Bend viewpoint on the Colorado River. Participate in an optional tour of breathtaking Antelope Canyon or an optional boat trip on Lake Powell. Drive on to Kanab, gateway to the North Rim of the Grand Canyon. Spend two nights in this historic movie town. Experience the magnificent Grand Canyon, walking along the North Rim (April and May departures will visit Grand Canyon on the South Rim instead). Enjoy the marvelous views walking or hiking trails. Time permitting, participate in a ranger talk at Grand Canyon Lodge. A scenic drive along Mt. Carmel Highway leads to Zion National Park, with its towering cliffs and deep gorges in shades of cream, orange, and red. Walk to a stunning viewpoint, then take a ranger-led shuttle bus through Zion Canyon and enjoy a hike in the park, maybe spotting a huge condor soaring in the thermals above the rim. Later in the afternoon drive back to Las Vegas. Say farewell at dinner. Tour ends. If you have any questions please feel free to contact us at info@traveldreamwest.com. The National Park Tour is a great alternative to our longer grand circle tours and offers a wonderful overview of this area.